Bangladesh lost three early wickets after being set a daunting target of 335 runs for victory and were facing another comprehensive defeat inside three days at tea on the third day of the second and final Test against the West Indies in Jamaica on Saturday. Shakib Al Hasan gave a captain's effort with the ball, taking six for 33 as the West Indies were routed for just 129 in their second innings from the overnight position of 19 for one at Sabina Park. However the bowling star will have to perform similar heroics with the bat just to prolong the match into a fourth day as the tourists were reduced to 52 for three at the interval. Shakib will resume his innings in the final session of the day and it will require a performance unlike what has been seen so far from the Bangladesh batting line-up in this brief series to prevent the West Indies wrapping up the match and sweeping the rubber 2-0 with two days to spare. Any semblance of optimism they would have enjoyed after the bowling performance disappeared virtually at the start of their second innings when West Indies captain Jason Holder trapped Tamim Iqbal leg-before without scoring. Liton Das played positively for 33 but fell in the penultimate over of the session, caught by Shai Hope in the gully off debutant Keemo Paul. Worse was to follow with the interval just seconds away when Roston Chase, brought on to bowl his off-spin in the final over of the afternoon period, caught Mominul Haque plumb in front when the left-hander played down the wrong line of a straight delivery. Chase had top-scored with 32 in the West Indies second innings as they struggled to build on a huge first-innings lead of 205 runs. Shakib continued from where he left off late on day two when he dismissed first-innings century-maker Kraigg Brathwaite with the first ball he bowled. Devon Smith, whose place in the team continues to be a topic of discussion among West Indians scribes and fans, added fuel to that debate when he was the first to fall in the morning, drawn out of his crease and stumped neatly by Nurul Hasan for 16. Nightwatchman Paul and Kieran Powell opted to counter-attack and added 25 runs before Nurul was again called upon to exhibit his clinical glovework when Paul heaved at Shakib and the wicketkeeper lifted the bails with the debutant found marginally short of his ground. Two more wickets fell in the space of 11 runs as Powell was trapped leg-before to give Shakib his fourth wicket in a row, while there was also little doubt about the LBW verdict given against Hope off the bowling of the other left-arm spinner, Taijul Islam. Chase then joined Shimron Hetmyer and the pair continued to play positively, occasionally living dangerously but advancing the score towards the three-figure mark. Their stand was worth an enterprising 33 runs when seamer Abu Jayed, brought on in pursuit of the breakthrough, did just that by removing the attacking Hetmyer via the LBW route with the lunch interval beckoning. There was even less resistance when play resumed after the break. Mehidy Hasan got into the wicket-taking act by bowling Chase round his legs and then having Holder stumped. It was then left to Shakib to wrap up the innings with the wickets of Miguel Cummins and Shannon Gabriel in the same over. 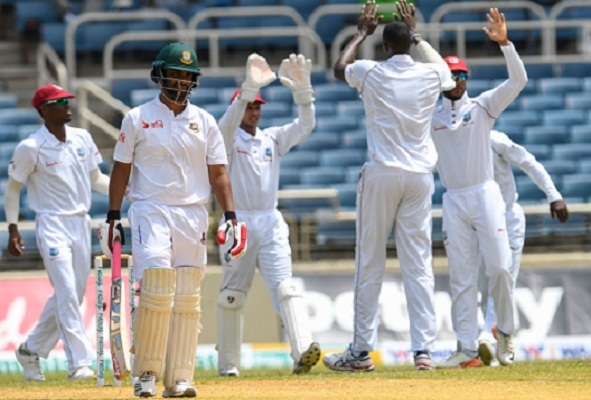 Bangladesh need 283 more runs for victory with seven wickets in hand.